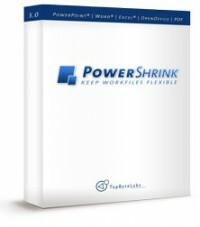 PowerShrink v5.0 lets you compress, native Microsoft Office & Adobe PDF files and deliver industry-standard files with tools that are easy to use, and easy on your budget. PowerShrink is redesigned to be simple and easy to use for new and experienced users. With our new comfortable user interface you will be able to optimize PDF, PowerPoint, Word, Excel, JPEG, GIF, PNG, BMP & EMF files easily & effectively. With a brand new set of compression options you can be sure there is an compression option that suits your needs – and if not, define your own custom compression settings. No matter, your selection you will agree that PowerShrink is an extremely efficient compression tool. Another brand new feature included in PowerShrink to make your life easy while searching your local or network drives for files to compress. Apply search filters to find only the files you really need to optimize. Select Size, Date or File Type or mix them freely to get the results you need. PowerShrink supports drag-and-drop file compression saving you time whenever you need to compress one or more files. Simply drag all the files you need to compress into PowerShrink and optimize. Compress to a minimum save the MAXIMUM! Discover the Secret That’s Got Millions of MS Office-Crazy Users Worldwide Actually LOVING Compressing Time!PowerShrink compresses your original Microsoft® PowerPoint document at a fraction of the time of Microsoft® Office® built in compression features at a better rate. PowerShrink allows you to compress to a minimum and save the MAXIMUM. Instead of wasting time on technical issues you can now focus totally on the company’s business objectives. PowerShrink lets you optimize virtually any Microsoft Office and Adobe PDF files up to 98%. Downloaded 1,000,000+ times. PowerShrink is one of the world’s most popular PowerPoint compression software. Drag-and-drop File compression. PowerShrink supports drag-and-drop file compression saving you time whenever you need to compress one or more files. Compress 20+ file types. Compress any of the following file formats, Microsoft Word (DOC, DOCX), Excel (XLS, XLSX), PowerPoint (PPT, PPTX), Adobe (PDF), BMP, TIFF, JPEG, GIF, PNG, and many more. Compression customizable options. A choice from predefined compression settings allow you to select the perfect balance between quality and outcome file size. Search Wizard. Brand NEW search wizard to scan your drives for files that can be optimized. Set advanced search filter options based on Size, Date or file extension. There is a setting for every possible need. High compression ratios. PowerShrink optimizes your Microsoft Office and Adobe PDF files significantly. With compression rates with up to 98% be sure to save huge amounts of storage, and finally get E-Mails sent despite limitations. Our latest feature lets you seriously reduce the size of your PDF files. PowerShrink offers a straight forward interface with only a few steps to compress PDF files. Compress JPEG, TIFF, BMP, GIF, PNG and EMF images. Optimize PDF, PowerPoint, Word and Excel files by 50-90% without zipping.